Believed you were capable of saving him although dead. On the fourth Martha and Mary set out for the bright heavens. 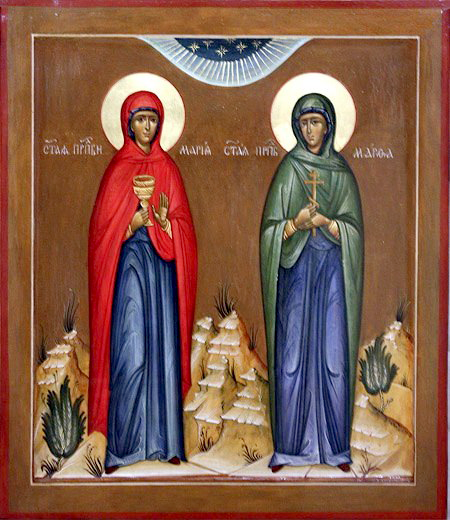 One of the Lord's most beloved families, Mary and Martha lived with their brother Lazarus at Bethany, a village not far from Jerusalem. They are mentioned in several episodes in the Gospels. 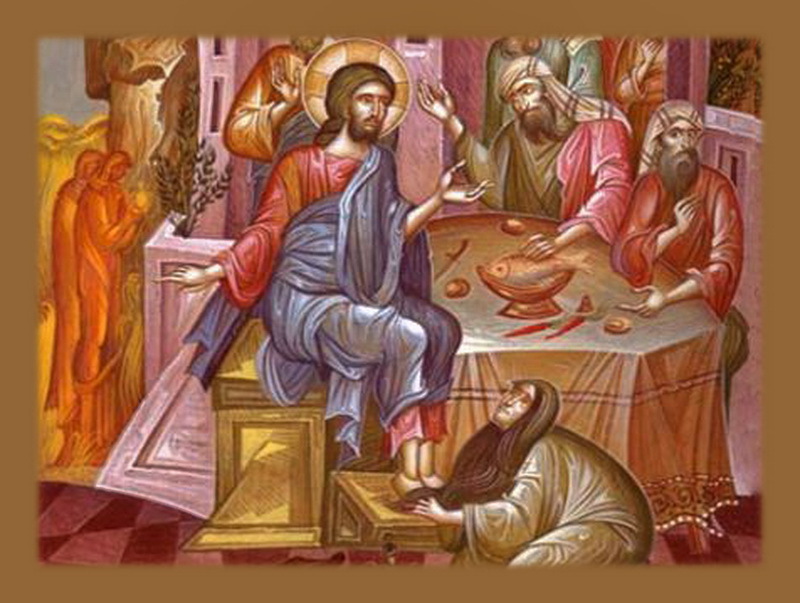 On one occasion, when Jesus and His disciples were their guests (Luke 10:38-42), Mary sat at Jesus' feet and listened to Him while her sister Martha busied herself with preparing food and waiting on the guests, and when Martha complained, Jesus said: "Martha, Martha, thou art careful and troubled about many things, but one thing is needful, and Mary hath chosen that good part, which shall not be taken away from her." 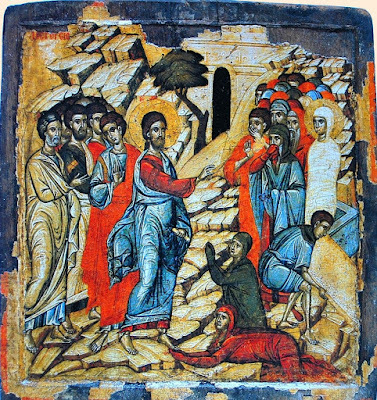 When Lazarus, the brother of Mary and Martha, had died, Jesus came to Bethany after four days, for they were friends. Martha, upon being told that He was approaching, went out to meet Him, while Mary sat still in the house until He sent for her. It was to Martha that Jesus said: "I am the Resurrection and the Life" (John 11:1-44). 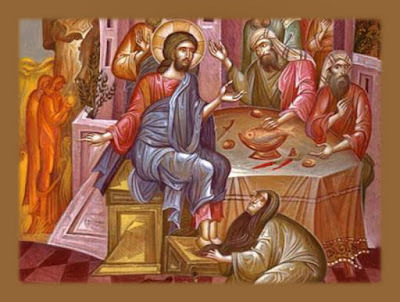 Again, about a week before the crucifixion, as Jesus reclined at table, Mary poured a flask of expensive perfume over Jesus' feet, which she wiped off with her hair. Mary was criticized for wasting what might have been sold to raise money for the poor, and again Jesus spoke on her behalf (John 12:1-8). On the basis of these incidents, many Christian writers have seen Martha as representing Praxis (active virtue, doing good works, love of neighbor), and Mary as representing Theoria (divine vision, the contemplation of divine words and judgments, love of God). They see the same symbolism also in Leah and Rachel, the daughters of Laban (Genesis 29 and 35). Leah was dim of sight, but had many children. Rachel had few children, but one of them saved the whole family from destruction. Leah represents Praxis, which is near-sighted and cannot penetrate very far into the mysteries of God, but it produces many worth-while results. Theoria has fewer results, but one of those results is faith, without which it is impossible to please God" (Hebrews 11:6). Yet, there is a sense in which Praxis comes first -- "If a man love not his brother, whom he hath seen, how shall he love God, whom he hath not seen?" (1 John 4:20) So it is that Leah must be wed before Rachel. 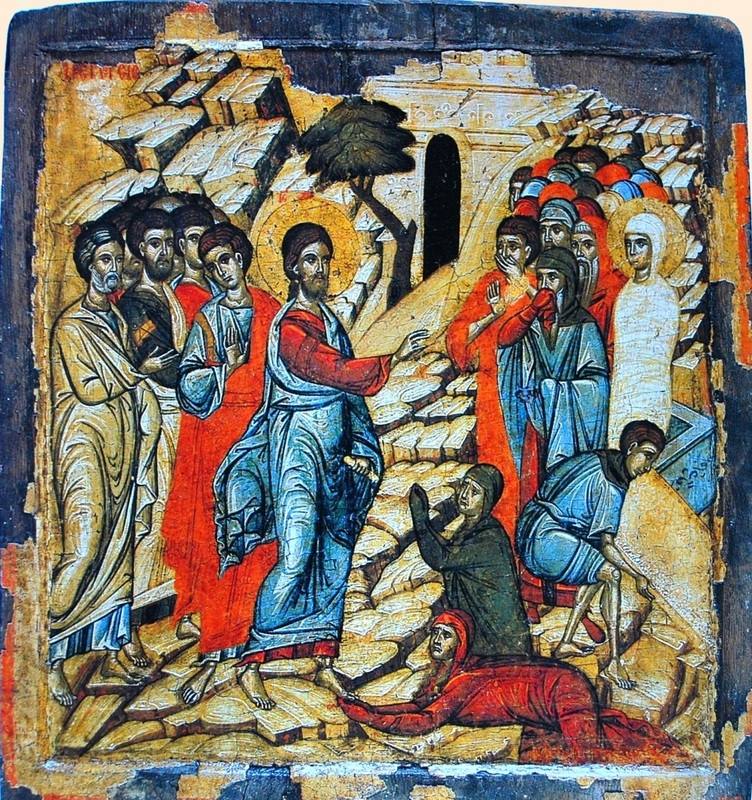 Orthodox tradition also relates that Lazarus was cast out of Jerusalem in the persecution against the Jerusalem Church following the martyrdom of Saint Stephen. His sisters Mary and Martha fled Judea with him, assisting him in the proclaiming of the gospel in various lands. The three later moved to Cyprus, where Lazarus became the first Bishop of Kition (mod. Larnaca). All three reposed in Cyprus. 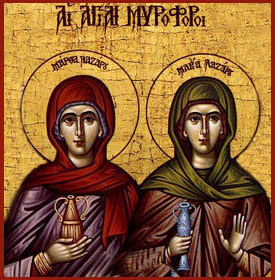 Martha and Mary are also considered two of the Myrrhbearers, who went to prepare the body of Jesus in the tomb on the day of His Resurrection. You fervently believed in Christ and His marvelous acts, O Martha and Mary, sisters of Lazarus. You were adorned with radiant virtues, and were found worthy to be numbered with the saints; together with holy Lazarus pray to God for us. 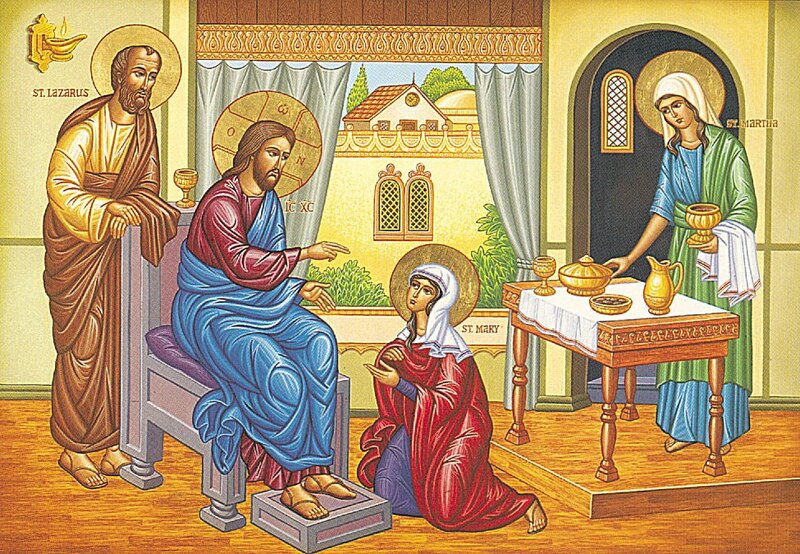 Hospitality, which Martha displays, is a great virtue which ought not to be scorned; but it is even greater to give heed to spiritual words.... See the Lord’s way of thought: He did not say anything to Martha until she had first given Him a reason to rebuke her. Only when she tried to draw her sister away from listening, did the Lord use the occasion to rebuke her. To practice hospitality is honorable, until that point is reached when it causes turmoil and draws us away from the things that are more important. When hospitality begins to hinder us from doing the things that are more important, then listening to divine words is preferable.... 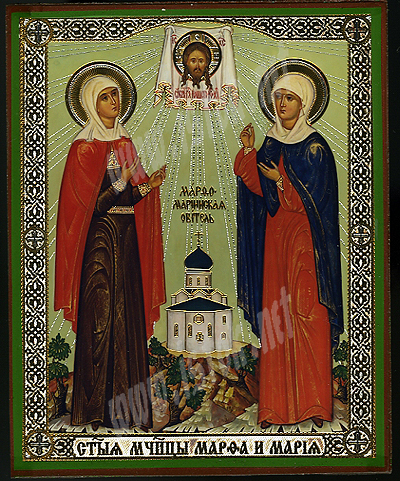 Understand that Martha represents active virtue, while Mary represents divine vision. 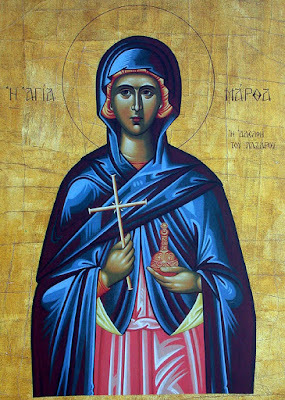 Action entails distractions and disturbances, but divine vision, having become the ruler of the passions (for Maria means "mistress", "she who rules"), devotes itself entirely to the contemplation of the divine words and judgments. Give heed also to these words of the Gospel: "Mary sat at Jesus’ feet and listened to His words." The feet are understood as symbols of active virtue, representing movement and step-by-step progression. And sitting is a symbol of steadfastness and constancy. Therefore, whoever sits at the feet of Jesus, that is, whoever steadfastly follows and imitates Jesus, is established in all active virtue. Then such a man will also come to the listening of the divine words, that is, he will attain to divine vision. Mary sat first, and by doing this she was then able to listen to Jesus’ words. Therefore, you also, O reader, if you have the strength, ascend to the rank of Mary: become the mistress of your passions, and attain to divine vision. But if you do not have the strength, be Martha, and devote yourself to active virtue, and by this means welcome Christ.... Activity has a part that will be taken away from it, namely, the cares and distractions that accompany it. For as a man progresses and attains to divine vision, he is freed from distractions and troubles, and so it can be said that something is taken away from him. But he who is engaged in divine vision shall never be deprived of that good part, the vision of God. What else is there to attain, once he has reached this pinnacle, that is, once he sees God, which means that he is deified? He who is found worthy to see God, becomes God. For something is comprehended only by that which is like unto it. Until now, by it, many souls were drawn to Paradise. Immeasurable and cordial and not hypocritical. That is why, the life of King Saul, he strictly guarded. With Hospitality, each one of them heavenly paradise attained. Hospitality most worthy in word and in deed. And, to them, eternal glory spread throughout the entire world. The Lord loves the Hospitality of a sincere heart. Teaching that we are also guests at the table of the Lord.